With the rise of mobile phones and technology, the internet is closely intertwined with our daily lives. 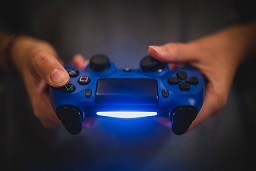 For some individuals, the compulsive use of Internet and Gaming affects their career and relationships. Our programme help them to understand, manage and stop compulsive Internet use, Video and Mobile Gaming. feel preoccupied with the Internet and/or gaming (think about previous online activity or anticipate next online session)? feel the need to use the Internet and/or gaming with increasing amounts of time in order to achieve satisfaction? repeatedly made unsuccessful efforts to control, cut back, or stop Internet use and/or gaming? feel restless, moody, depressed, or irritable when attempting to cut down or stop Internet use and/or gaming ? stayed online and/ or game longer than originally intended? jeopardized or risked the loss of a significant relationship, job, or educational or career opportunity because of the Internet and/or gaming? lied to family members or others to conceal the extent of involvement with the Internet and/or gaming? use the Internet and or gaming as a way of escaping from problems or of relieving a dysphoric mood (e.g., feelings of helplessness, guilt, anxiety, depression)? If you find yourself gaming or surfing the net excessively, seeking professional help early can help to reduce the harmful consequences and social & economic costs of problem gambling. Screening - The aim of the initial session is to identify the presence of excessive gaming and/or problematic internet use problems and any negative consequences. Any other existing mental health conditions are screened for in order to provide a deeper understanding of the client. Assessment - This is a comprehensive understanding of the severity and depth of the excessive gaming and problematic internet use in the context of the client life's situation. The individual's strengths, weaknesses, problems and needs are accounted in order to collaborate an effective solution. A discussion of potential risks is also integrated into the treatment planning. Treatment Planning + Counselling - The treatment plan is tailored to the client's needs. Immediate and long-term goals are established. A discussion of WE CARE's holistic services is included in the treatment planning. 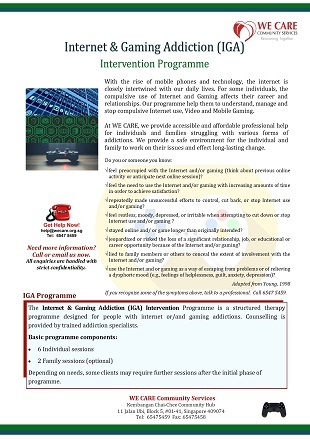 The Internet & Gaming Addiction (IGA) Intervention Programme is a structured therapy programme designed for people with internet or/and gaming addictions. Counselling is provided by trained addiction specialists. Depending on needs, some clients may require further sessions after the initial phase of programme.